The Japan Analytical (JAI) Recycling Preparative GPC system allows for the separation and purification of polymers and other materials on a preparative (~ 1 g) scale in a single run. In addition, a built-in recycling capability permits closed-loop recycling of mobile phase and analyte through the column set in order to increase the separation capability of the columns without using large amounts of solvent. A fraction collector collects fractions using a pre-determined timing method, or can be programmed to collect “slices” of eluting peaks. 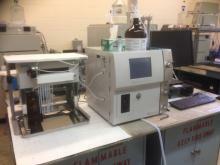 The instrument is equipped with dual inline UV-Vis and RI detectors. This instrument uses chloroform (CHCl3) as the primary eluent, but can also be run with THF.